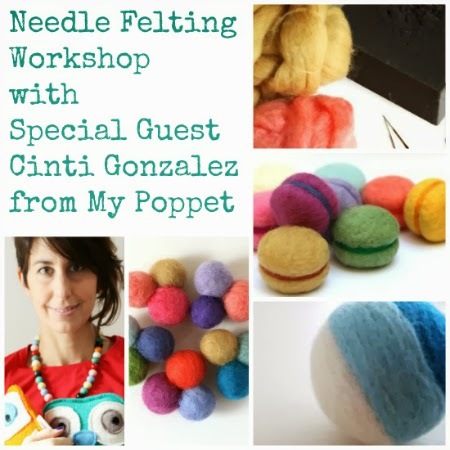 Cintia Gonzalez from My Poppet is a Melbourne based blogger/crafter and among her many talents is needle felting. Her felted items & tutorials have appeared in publications including Mollie Makes & Homespun. I'm really excited to get Cintia up the hill to my Monbulk shop for a one off workshop covering all the basics to needle felting. In 2 & 1/2 hours, she will cover 2 felting techniques. 1. Felting onto flat surfaces where we will learn to felt designs onto a felt fabric (this will be supplied) and convert this into a cool mug cover for you to take home. 2. Felting 3 dimensional shapes and joining them. Make simple shapes such as balls, hearts and cones then join them to make desired creations such as brooches, animals etc. The cost of $40.00 including GST covers the workshop with Cintia. If you do not have your own materials, they will all be available to purchase on the day of workshop. Places are limited so don't miss out. Book now online.